Lamborghini's Urus goes on sale in 2018. It boasts a V-8 twin turbo engine. 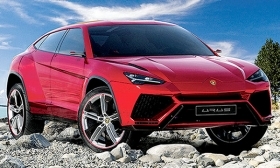 SANT'AGATA BOLOGNESE, Italy — The new V-8 twin turbo engine in Lamborghini's Urus SUV will churn out 650 hp, CEO Stefano Domenicali said in an interview. The large SUV, about 196 inches long and 78 inches wide, will be unveiled by the end of this year at the company's factory here. The Urus will go on sale in Europe in the second quarter of 2018. U.S. sales will follow in the third quarter at a price expected to start below $200,000 before the gas guzzler tax. The engine also will be available as a plug-in hybrid version a year after the standard model launches, Domenicali said. He said the superluxury brand, part of Volkswagen Group, plans to build 1,000 SUVs next year and 3,500 units starting in 2019, though production could grow if demand is higher. Lamborghini last year built about 3,500 two-seat sports cars. The Urus will be built alongside the Huracan and Aventador sports cars.